It’s understandable that after occupying India for centuries, the British Empire left behind a wide-ranging and remarkable legacy (by no means all good, of course). Some of the more visible reminders include a passion for trains, a blazer-clad school system more suited to Manchester than Mumbai, and (if my reading experience is anything to go by) a love for Victorian literature. How else could you explain the plethora of long, winding, lovingly-crafted classics written by English-speaking writers from the subcontinent? 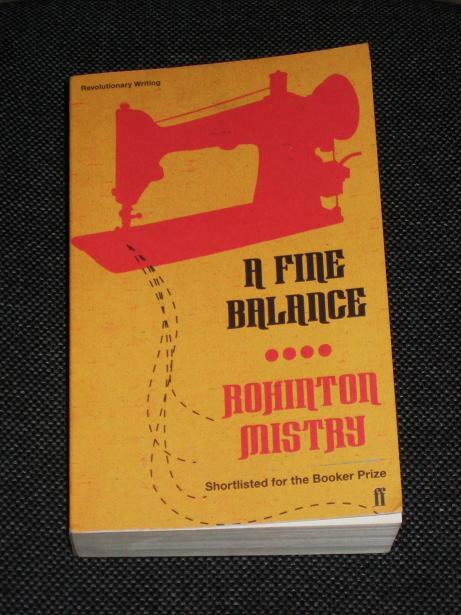 Last year, I read Salman Rushdie’s Midnight’s Children and Vikram Seth’s bookshelf-busting tome A Suitable Boy; my latest read, Rohinton Mistry’s A Fine Balance, is every bit as enjoyable, brilliant… and long. A Fine Balance is mostly set in 1975, a year of particular significance in Indian history. Against the backdrop of the Emergency, a period of virtual martial law declared by Prime Minister Indira Gandhi in a desperate attempt to retain power (and avoid punishment after being found guilty of election fraud), four strangers meet in the doorway of a Mumbai house, unaware that the next year will see them bond into a group which will help replace their absent families. Dina, a proud young widow seeking tailors to help with her sewing work; Ishvar and his nephew Omprakash, poor, low-caste tailors who have travelled to the big city to make their fortunes; Maneck, the son of one of Dina’s old school friends, abandoning the mountains and his parents’ shop to study for the future. What follows is beautiful and heart-rending, touching but sickening, enjoyable yet despicable: it’s a very emotional book. Despite Dina’s initial reluctance to get too close to her employees, through Maneck’s persuasion she eventually softens her attitude, and the four start to create their own family-type unit, passing the lonely evening hours together and helping to fill the gap left by the dead, the absent or (in the case of Dina’s brother) the unpleasant. However, every time life appears to be looking up, it turns around and bites them, leaving them with literal and metaphorical scars to lick. I won’t say what they are. Mistry’s book is an epic work, condemning Gandhi’s selfishness, exposing the cruel practices and horrific retribution of the higher of India’s castes against the lower strata of society and revealing the chaos prevailing in the world’s largest democracy. It’s not just the more brutal, violent events which stay in the memory; Mistry paints a picture of dilapidated slums, streets filled at night with crowds of homeless people and deliberately-crippled beggars hoping to stand out and make the relatively well-off passersby reach into their pockets for a small coin or two. In its depiction of the urban poor, A Fine Balance is positively Dickensian – and that’s a very good thing. There is also a sharp focus on those at the top of the tree, who are divided into three, intertwining groups: the rich, those with high office or status, and the high-caste Brahmins who treat the lower caste Chamaars more like animals than people. These lucky few are protected from the prevalent misery by virtue of their fortune, and they make the most of it by ensuring that anyone outside their group is trodden down mercilessly into the dirt of the Mumbai slums. Anyone who has managed to scramble a little way up the ladder is even more fervently in favour of ‘cleansing’ the scum from the streets than the corrupt politicians who think up the ideas, happy to avert their gaze while the poor are mutilated, sterilised and left to rot in the streets. Now that I have thoroughly depressed you, I can give you the tiny ray of optimism that Kali-Yuga would not allow. This is a wonderfully-written book, one which I am sure to read again and again in the future, even if, at times, it makes for painful reading. The parallels to the work of Dickens are not limited purely to the idea of writing about the plight of poor people; the way in which Mistry’s eye notices every little detail, his nose every pungent odour, his ear every conflicting note of the cacophony permeating Mumbai street life, is reminiscent of his Victorian forebear’s description of life in nineteenth-century London. P.S. Jackie of Farm Lane Books has created a wonderful array of supplementary information on this novel at Book Drum, a site where passionate readers help others get the most out of their favourite novels: please drop by to get even more information about A Fine Balance! I'm so sad to learn about the slum dwellers being removed. I really hope they are being treated a bit better than they were in the 1970s. Thank you for mentioning my Book Drum profile. I hope that you found it useful. Hi Tony, a great riff on a wonderful book. Cheers. Thanks Kevin 🙂 As mentioned, I think it's wonderfully written, and it'll definitely be near the top of my books of the year. I read this book earlier this year. Went to become one of my favorites of all time. I haven't read Midnight's Children though, or many Dickens. Been meaning to I do! Oh no, that's sad news indeed.. I also loved A Fine Balance, which I've read also only recently, and you are so right, it is Dickensian! I've loved every Dickens novel I've read, and I also loved Midnight's Children. However, I didn't really see this one as more depressing as MC. It was sad but, like Dickens, also tinged with humour. But yes, it was very painful to read.. especially near the end.. heartbreaking. I read A Fine Balance almost 10 years ago and was simultaneously impressed and depressed by it. I think it was the first novel I read as an adult that showed how difficult life can be and how there may not be a silver lining for everyone, that happiness is fleeting. It was brilliant and beautifully written but I can't make myself re-read it just yet. Maybe one day when I've matured a bit more. Do read 'Midnight's Children' – fantastic book 🙂 I'm not sure why I haven't read anything else by Rushdie (perhaps I feel that anything else would just be a letdown…).